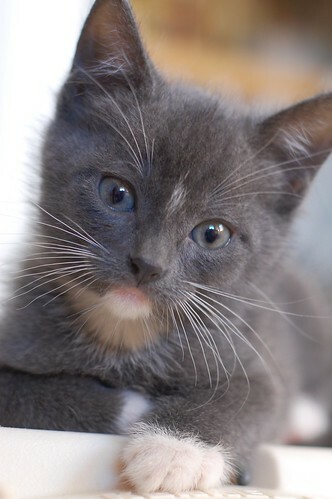 This dapper little lad is marked like a tuxedo, but his coat is a velvety, charcoal gray with subtle stripes. I suppose you could say he's wearing his morning suit. My big man cat is like that too! Tux markings, velvety fur, and very faint stripes! Is this little guy's fur wavy when you look at it up close? Oh my lord! 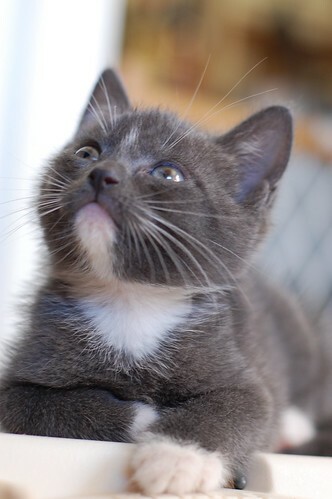 I am having some major kitten yearnings! These little ones are adorable! I love how kittens already have the cat poses down! i must say he carries off the look better than prince charles does. He's so adorable, but I esp. love the teensy white patch between the eyes, his white chin and paws. And he poses so wonderfully! Great pics as always. I'm in love with this gloved boy! Love his pink little bottom lip! methinks he needs a monocle. The Cat in the Gray Flannel Suit! I think Melissa said it best! What a cutie. what a lovely little man! What an adorable fuzzmeister. It always amazes me how one litter of kitties can have so much diversity. OHHH!!!! Oh my, all the superlatives in the world won't do him justice... I haven't seen such a lovely gray boy in a long time!! I am SMITTEN!! He really is ruggedly handsome to quote Rick Castle. You take the most AMAZING photos. Have you thought about a book of these wonderful kittens? Oh, what a distinquished little man! Second picture squeels -"O! 'Allo there!" It looks like he might be odd-eyed too, or is it just my monitor? this is a very pretty litter of kittens so far! so clean and perfectly manicured! The Cat in the Grey Flannel Suit....*heehee* He's adorable! Aw, he IS in a morning suit! Fancy dress boy needs a proper British name to go with his attire! Harry? Reginald? Alastair?? OMG, those chubby little paws - squee! He's so cute! One of our two tuxies has a white marking under her chin like this wee one's. We affectionately refer to it as the "Kazenzunge" -- German for "Cat Tongue." It's a type of chocolate allegedly shaped like cats' tongues .... and it comes in dark, milk, white, or blended flavors. And whether we're talking kitten or chocolate, YUUUUM! Awww he looks just like my kitty. Love love love. SOOOO distingue' . . . Do my boys need a brother? We call this the "Sears pose" or just "Sears" at our house. Panda, our tuxie, does it too, and it always makes me think of the menswear section in the old Sears catalogues - a photo of a ruggedly handsome male model sporting a cable knit sweater, leaning casually against a wooden gate, often with a manly pipe stuck in his mouth. So silly, I know! This serious little baby does an excellent Sears! Oh my goodness....I am in love....but neither Miss Marbles nor I can cope with a kitten. We are still recovering from Toes' trip across the bridge. This little guy lit my day up! Oh goodness, he appeals to my love of tuxies and greys. I am slain! Awwww .. those cute little paws made mom want to kiss them. This took my breath away. This little one looks just like, I mean almost exactly like my Felix. From the white spot on the forehead down to the white chin/neck/chest and white paws. Felix passed on March 2009 from CFR at a ripe old age of 12 (although we've learned now that CFR could be prevented with better nutrition - more wet food!). Felix was our son. We don't have any children, and Felix was adopted just a couple months after my husband and I got married. He was a very, very intelligent cat. Very loyal to my husband and I. And yes, he looked like he was made of velvet too. Felix and this little Itty Bitty Kitty are almost twins. I've seen Grey and White Tuxedo cats before but none of looked almost spot on to Felix before. Who ever (whomever?) adopts this guy, my prayer for you is that you will experience the amazing joy that our Felix gave us. He was nursemaid to me after surgery. He cared for a family member after she lost her daughter. Felix was an extraordinary being. I can see in this little guy's eyes that he is too. Oh this one is adorable. I want this little one to come home with me big time!! Good thing I am not nearby or am allowed more than two cats. I just love his "morning" suit! What gorgeous blue eyes you have there!! I hope they stay blue.